A perfect blend of style, size, technology and affordability. Union Square has created its own market, its own niche in Union City contemporary condominium living. With only 40 residences, it has an intimate and inviting ambiance. Located just outside the New Jersey side of the Lincoln Tunnel, Union City is a charming, progressive and reasonably priced alternative to Manhattan and Hoboken. 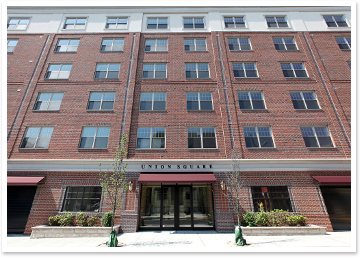 Union Square is the only State of New Jersey "Energy Star Program" approved condo building in Union City. More than simply feeling eco-conscious about buying Energy Star, residents can actually experience a better living environment. The energy efficient systems, fixtures and appliances will also reduce the monthly household costs. Union Square will also be the first building in Union City with "Virtual Doorman" technology. More than just security, with VDM your deliveries will be safely stored in the package room while you are away. For people whose definition of luxury encompasses beauty, functionality and convenience, Union Square will prove itself to be an exceptional choice. © Copyright 2011 Union Square Condo Association, Inc.